The House of Nod, a film production company based in Brooklyn NY, will be using the opportunity presented by our festival week to make a film about Miller and his time in Paris. The folks gathering around Shakespeare & Co., at our 80th-Anniversary-of-the-Publication-of “Tropic of Cancer” at Dorothy’s Gallery, our Soirée Chez Jenny, and all the places Miller went that are still alive and well throughout the city will provide inspiration and content – we look forward to being followed by the camera! 8:00 pm: “Flush Game, Or the Gospel According to Henry Miller,” a play by Corneliu Mitrache at Carr’s Pub & Restaurant, 1 Rue du Mont Thabor, 75001 Paris, Metro: Tuileries. More info here. 12 noon – 7 pm: “Home Base” pop-up book store at Shakespeare and Company (37 Rue de La Bucherie.) Rare manuscripts, letters, first editions, books, good coffee, and more! 7 pm – 10 pm: Opening Night party hosted by Ping Pong, the official literary magazine of the Henry Miller Library! Poetry, drinks, and much more. At the Shakespeare and Company (37 Rue de La Bucherie.) FB event here. 5-6:30pm: Acclaimed singer-songwriter Al Rose with guitarist Steve Doyle performs “en plein air” outside Shakespeare and Company. 7:30 pm: 80th Anniversary of the Publication of “Tropic of Cancer” in Paris Celebration! Join us for an evening of cocktails, music, and talks celebrating this seminal work at Dorothy’s Gallery at 27, Rue Keller, 75011. This event is by donation. Reserve your spot here. Click here for speaker information. This event will be part of a larger Miller exhibition at Dorothy’s Gallery to be held from May 6-10. See full program here. 5-6:30 pm: Acclaimed singer-songwriter Al Rose with guitarist Steve Doyle performs “en plein air” outside Shakespeare and Company. 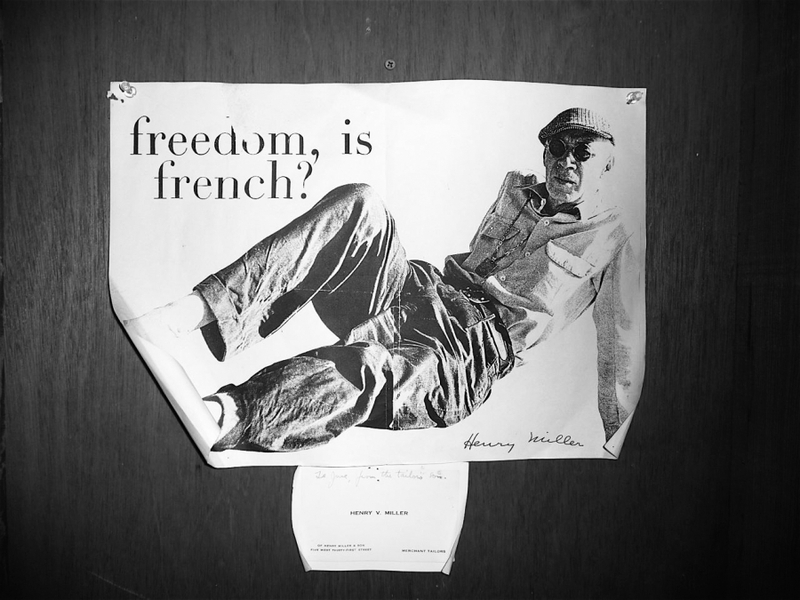 7:30 pm: Henry Miller Library in Paris Soirée at Chez Jenny, 39, Boulevard du Temple. The evening will include a three-course meal, some wine, music, and talks from, Jim Haynes, host of Paris Sunday Dinners and author of “Homage to Henry Miller,” Mary Duncan, writer and advisor to the Henry Miller Library Board, writer Katy Masuga, and more. Cost: 35 Euros. Seating is limited! Purchase your tickets, before Sunday, May 4 @ 7PM HERE. 4:45-6:00pm: Ed Masuga performs live, along with Al Rose an guitarist Steve Doyle PLUS Berkeley’s Ed Masuga, “en plein air” outside Shakespeare and Company. 9:00 pm – 1 am: Jesse Goodman and Colour 8 present a night of dream-time, immersive ambient and experimental music at La Flaq, 36 rue Quincampoix 75004. This event is by donation. Reserve your spot HERE. 3-4:30pm: Acclaimed singer-songwriter Al Rose with guitarist Steve Doyle performs “en plein air” PLUS Berkeley’s Ed Masuga, outside Shakespeare and Company. 5-6:30 pm: Parisian premiere of “Big Sur,” the Michael Polish film based on the Jack Kerouac novel, at Cinéma le Grand Action, 5 rue des Ecoles. 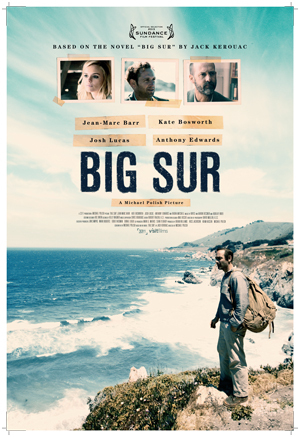 “‘Big Sur’ cracks the code of how to adapt Jack Kerouac for the screen” (New York Times.) Price is 8 Euros / $10 USD, advance tickets available online HERE and at Shakespeare and Company. The program starts at 5PM with a slideshow of photographs of the Big Sur coast by fine art photographer Kodiak Greenwood – not to be missed! Special guests Vilmos Zsigmond and Jean-Marc Barr. Tickets HERE. 9-11:00 pm: Alison Young & Son Sublime Orchestre at Le Chair de Poule, 141 Rue Saint Maur. More info here. 5:00 pm – Launch of brand new book, “Proteus and the Magician, the letters of Henry Miller and John Cowper Powys”, edited by Jacqueline Peltier, published by the Powys Press – everyone is welcome to attend. At Shakespeare and Company (37 Rue de La Bucherie.) Register HERE.